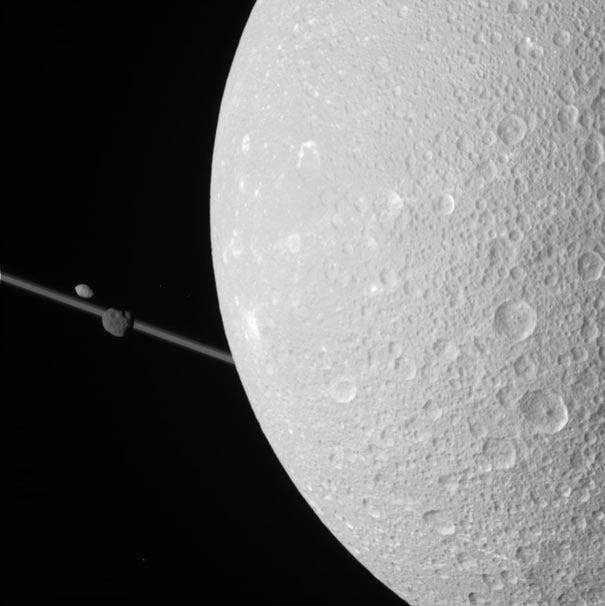 The cratered surface of Saturn's Dione dominates the image above , with Saturn’s rings on the left, nearly edge-on, and two more moons as well: Epimetheus, only about 130 km (70 miles) across, and Pandora. The Cassini spacecraft has been touring Saturn and its moons for seven years. Yesterday, the probe swung past the icy Dione at a distance of just 99 kilometers (62 miles) over the surface! 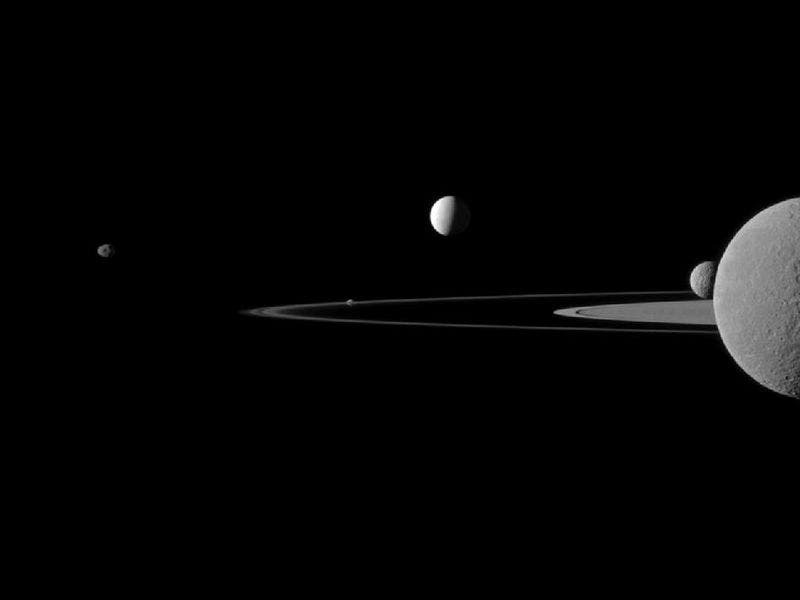 In the image below, NASA's Cassini spacecraft captured five of Saturn's moons in one image: Janus, Pandora, Enceladus, Mimas and Rhea. Janus (179 kilometres, or 111 miles across) is on the far left. Pandora (81 kilometres, or 50 miles across) orbits between the A ring and the thin F ring near the middle of the image. Saturn’s second largest moon, Rhea (1,528 kilometres, or 949 miles across), is bisected by the right edge of the image. The smaller moon Mimas (396 kilometres, or 246 miles across) can be seen beyond Rhea also on the right side of the image. New discoveries on two of Saturn's 60 moons could fill the storyline for a full season of a SciFi Channel series on the hunt for extraterrestrial life. Natural electrical activity was discovered last fall on Titan, the largest of Saturn's moons followed by the announcement that scientists working on NASA's Cassini mission have detected sodium salts in ice grains of Saturn's outermost ring. Detecting salty ice indicates that Saturn's moon Enceladus, which primarily replenishes the ring with material from discharging jets, could harbor a reservoir of liquid water — perhaps an ocean — beneath its surface. And, where's there's an ocean, there's a higher probability of finding some form of life. "The original picture of the plumes as violently erupting Yellowstone-like geysers is changing," said Frank Postberg, Cassini scientist for the cosmic dust analyzer at the Max Planck Institute for Nuclear Physics in Heidelberg, Germany. "They seem more like steady jets of vapor and ice fed by a large water reservoir. However, we cannot decide yet if the water is currently 'trapped' within huge pockets in Enceladus' thick ice crust or still connected to a large ocean in contact with the rocky core." Cassini discovered the water-ice jets in 2005 on Enceladus. These jets expel tiny ice grains and vapor, some of which escape the moon's gravity and form Saturn's outermost ring. Cassini's cosmic dust analyzer has examined the composition of those grains and found salt within them. Cassini was launched from the Kennedy Space Center in 1997 and has been orbiting Saturn since July 2004. "We believe that the salty minerals deep inside Enceladus washed out from rock at the bottom of a liquid layer," said Postberg. Scientists on Cassini's cosmic dust detector team conclude that liquid water must be present because it is the only way to dissolve the significant amounts of minerals that would account for the levels of salt detected. The process of sublimation, the mechanism by which vapor is released directly from solid ice in the crust, cannot account for the presence of salt. 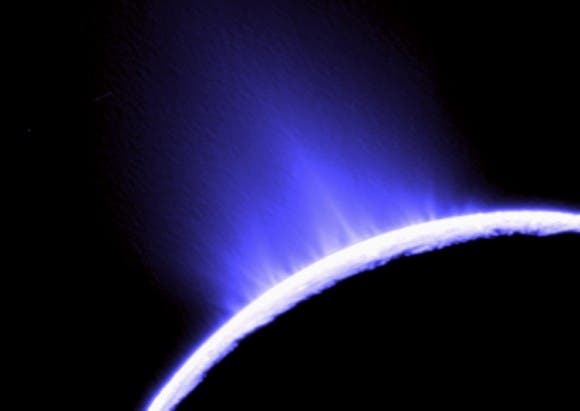 "Potential plume sources on Enceladus are an active area of research with evidence continuing to converge on a possible salt water ocean," said Linda Spilker, Cassini deputy project scientist at NASA's Jet Propulsion Laboratory in Pasadena, Calif. "Our next opportunity to gather data on Enceladus will come during two flybys in November." The makeup of the outermost ring grains, determined when thousands of high-speed particle hits were registered by Cassini, provides indirect information about the composition of the plume material and what is inside Enceladus. The outermost ring particles are almost pure water ice, but nearly every time the dust analyzer has checked for the composition, it has found at least some sodium within the particles. "Our measurements imply that besides table salt, the grains also contain carbonates like soda. Both components are in concentrations that match the predicted composition of an Enceladus ocean," Postberg said. "The carbonates also provide a slightly alkaline pH value. If the liquid source is an ocean, it could provide a suitable environment on Enceladus for the formation of life precursors when coupled with the heat measured near the moon's south pole and the organic compounds found within the plumes." However, in another study published in Nature, researchers doing ground-based observations did not see sodium, an important salt component. That team notes that the amount of sodium being expelled from Enceladus is actually less than observed around many other planetary bodies. These scientists were looking for sodium in the plume vapor and could not see it in the expelled ice grains. They argue that if the plume vapor does come from ocean water, the evaporation must happen slowly deep underground, rather than as a violent geyser erupting into space. "Finding salt in the plume gives evidence for liquid water below the surface," said Sascha Kempf, also a Cassini scientist for the cosmic dust analyzer from the Max Planck Institute for Nuclear Physics. "The lack of detection of sodium vapor in the plume gives hints about what the water reservoir might look like." Determining the nature and origin of the plume material is a top priority for Cassini during its extended tour, called the Cassini Equinox Mission. Scientists at Jet Propulsion Lab in California, the University of Colorado and the University of Central Florida in Orlando teamed up to analyze the plumes of water vapor and ice particles spewing from Saturn's Moon, Enceladus. They used data collected by the Cassini spacecraft's Ultraviolet Imaging Spectrograph (UVIS). The team, including, found that the source of plumes may be vents on the moon that channel water vapor from a warm, probably liquid source to the surface at supersonic speeds. "There are only three places in the solar system we know or suspect to have liquid water near the surface," said UCF Assistant Professor Joshua Colwell. "Earth, Jupiter's moon Europa and now Saturn's Enceladus. Water is a basic ingredient for life, and there are certainly implications there. If we find that the tidal heating that we believe causes these geysers is a common planetary systems phenomenon, then it gets really interesting." The team's findings support a theory that the plumes observed are caused by a water source deep inside Enceladus. This is not a foreign concept. On earth, liquid water exists beneath the 15-million year-old ice at Lake Vostok, in Antarctica. Scientists suggest that in Enceladus’s case, the ice grains would condense from the vapor escaping from the water source and stream through the cracks in the ice crust before heading into space. That’s likely what Cassini’s instruments detected in 2005 and 2007, the basis for the team’s investigation. The team's work also suggests that another hypothesis is unlikely. That theory predicts that the plumes of gas and dust observed are caused by evaporation of volatile ice freshly exposed to space when Saturn’s tidal forces open vents in the south pole. But the team found more water vapor coming from the vents in 2007 at a time when the theory predicted there should have been less. "Our observations do not agree with the predicted timing of the faults opening and closing due to tidal tension and compression," said Candice Hansen, the lead author on the project. "We don’t rule it out entirely . . . but we also definitely do not substantiate this hypothesis." Instead, their results suggest that the behavior of the geysers supports a mathematical model that treats the vents as nozzles that channel water vapor from a liquid reservoir to the surface of the moon. By observing the flickering light of a star as the geysers blocked it out, the team found that the water vapor forms narrow jets. The authors theorize that only high temperatures close to the melting point of water ice could account for the high speed of the water vapor jets. Although there is no solid conclusion yet, there may be one soon. Enceladus is a prime target of Cassini during its extended Equinox Mission, underway now through September 2010. "We still have a lot to discover and learn about how this all works on Enceladus," Colwell said. "But this is a good step in figuring it all out." Until the two Voyager spacecraft passed near Enceladus, the sixth-largest moon of Saturn, in the early 1980s, very little was known about this small moon except for the identification of water ice on its surface. The Voyager missions showed that Enceladus is only 500 km in diameter and reflects almost 100% of the sunlight that strikes it. Voyager 1 found that Enceladus orbited in the densest part of Saturn's diffuse E ring, indicating a possible link between the two, while Voyager 2 revealed that despite the moon's small size, it had a wide range of terrains ranging from ancient, heavily cratered surfaces to young, tectonically deformed terrain, with some regions with surface ages as young as 100 million years old. The Cassini spacecraft performed several close flybys of Enceladus in 2005, revealing the moon's surface and environment in greater detail. In particular, the probe discovered a water-rich plume venting from the moon's south polar region. This discovery, along with the presence of escaping internal heat and very few (if any) impact craters in the south polar region, shows that Enceladus is geologically active today. Given the level of tectonic resurfacing found on Enceladus, a critical factor in the evolution of life on Earth, has been an important driver of geology on this small moon. Enceladus the fourth body in the solar system to have confirmed volcanic activity, along with Earth, Neptune's Triton, and Jupiter's Io. rms on Enceladus. Two are based on methanogens, which belong to an ancient group related to bacteria, called the archaea — the hardy survivalists of bacteria that thrive in harsh environments without oxygen. Deep volcanic rocks along the Columbia River and in Idaho Falls host two of these ecosystems, which pull their energy from the chemical interaction of different rocks. The third ecosystem is powered by the energy produced in the radioactive decay in rocks, and was found deep below the surface in a mine in South Africa. NASA's Cassini spacecraft discovered a surprising organic brew erupting in geyser-like fashion from Saturn's moon Enceladus during a close flyby on March 12, 2008. Scientists were stunned that this tiny moon is so active, "hot" and teeming with water vapor and organic chemicals. "A completely unexpected surprise is that the chemistry of Enceladus, what's coming out from inside, resembles that of a comet," said Hunter Waite, principal investigator at the Southwest Research Institute in San Antonio. "To have primordial material coming out from inside a Saturn moon raises many questions on the formation of the Saturn system." The Casssini Ion and Neutral Mass Spectrometer saw a much higher density of volatile gases, water vapor, carbon dioxide and carbon monoxide, as well as organic materials, some 20 times denser than expected. This dramatic increase in density was evident as the spacecraft flew over the area of the plumes. New high-resolution heat maps of the south pole by Cassini's Composite Infrared Spectrometer show that the so-called tiger stripes, giant fissures that are the source of the geysers, are warm along almost their entire lengths, and reveal other warm fissures nearby. The warmest regions along the tiger stripes correspond to two of the jet locations seen in Cassini images. Organic chemicals were part of the raw material from which Enceladus and Saturn's other moons formed. The origin of Enceladus' heat is less clear, but there are several possibilities that could have given Enceladus a layer of liquid water that persists today. Early on, it could have been heated by decay of short-lived radioactivity in rocks, with the heating prolonged by tidal influences. Or perhaps an earlier oblong orbit could have brought more tidal heating than exists there today. A past tidal relationship with another moon could have caused the heat. Another theory says the heat could have been produced from a process called serpentization, where chemical binding of water and silicate rock could occur at the upper layer of the moon's core. This increases the volume of the rock and creates energy in the form of heat. We don't know how long it takes for life to start when the ingredients are there and the environment is suitable, but it appears to have happened quickly on Earth. So maybe it was possible that on Enceladus, life started in a "warm little pond" below the icy surface occurring over the last few tens of millions of years. For life to persist once it has been established requires an environment of liquid water, the essential elements and nutrients, and an energy source. On Enceladus, there is evidence for liquid water, but we don't know its origin. The March 12 close flyby indicates there are some complex organic chemicals, as well. An energy source of some sort is producing geysers. As Cassini's exploration continues, NASA is seeking to bring together more pieces of this intriguing puzzle. The image at the bottom of page was taken in visible green light with the Cassini spacecraft narrow-angle camera on July 29, 2011. Image scale is about 4 miles (7 kilometres) per pixel on Rhea and 7 miles (11 kilometres) per pixel on Enceladus.